Ethiopian Airlines (www.ethiopianairlines.com) runs internal flights to 20 cities and towns throughout the country from its hub at Addis Ababa Bole International Airport. 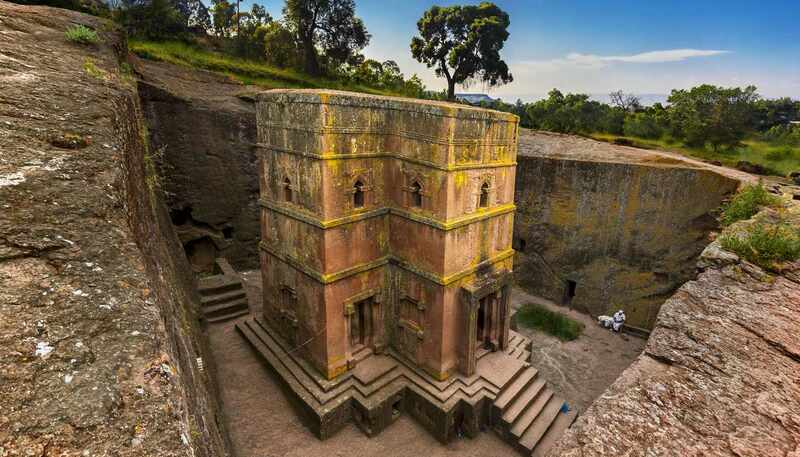 Domestic destinations include the highly popular 'Historic route' – connecting the capital with the main tourist destinations of Aksum (Axum), Bahir Dar, Gonder and Lalibela. Other domestic destinations include Arba Minch, Assosa, Bale Robe, Dire Dawa, Gambella, Gode, Hawassa, Humera, Jijiga, Jimma, Kabri Dar, Kombolcha, Mekelle, Semera, Shire and Shilavo. It is common to see a flight serving multiple destinations within the same day so it pays to make sure that your checked luggage is tagged for the right destination. On local flights, there is a boarding charge of 10 Birr per person. Expect to pay a much higher price (two to three times higher) for domestic routes if you don’t hold an Ethiopian passport, resident permit, or international tickets with Ethiopian Airlines. Ethiopian Airlines has an app which you can book and pay for your tickets. The company also offers the widest payment options in comparison to other airlines in Africa. Ethiopia's road network has improved substantially in the past decade thanks to an extensive road maintenance program. Almost every major road is tar-sealed. Off-roading routes, such as driving to remote hiking or rock climbing starting points, remain largely unsealed. As of June 2018, the roads in the mountainous region of Lalibela are being repaved and tar-sealed. The major roads leading out from Addis Ababa are tar-sealed, all-weather roads, although not all roads have street lighting. Minor roads in smaller towns may remain unpaved. Also, during the wet season, some roads in the east and south of the country may become impassable. Self-driving car hire is available within Addis Ababa. Outside of the capital, you can hire a car with a driver through a tour company. These drivers tend to know the local areas very well and can take you from one place to another effortlessly. Tips are expected. Within Addis Ababa there are two types of taxis. You can hire a yellow taxi which is differentiated by its newer fleet of cars at Addis Ababa Bole International Airport or outside of major hotels. Although every yellow taxi is fitted with a meter, fares are usually negotiated first. Blue taxis, on the other hand, tend to be older cars and they aren’t metered. It is advisable to negotiate with the driver before you travel with them. Shared taxis, in a form of shared minibuses, are common in towns and between villages in the countryside. Routes are fixed and fares are inexpensive. Each shared taxi has a driver and a conductor who shouts out the route and collects the journey fees. As each route is fixed, you may need to take two or more minibuses to get across town. Bajajs, similar to tuk-tuks, are common throughout the country except within the city limit of Addis Ababa. These three-wheelers can take three to five people, while some are even fitted to transport goods. Keen cyclists have discovered the rewards of cycling in Ethiopia. Although terrain can be tough, the stupendous views more than make up for it. Many cyclists choose to bring their own bike and hire a local driver to carry spare parts for maintenance or join a local cycling tour. As Ethiopia's road network has improved, so has its inter-town public transport network. Public buses, painted yellow and red, are basic and cheap, though they can be crowded. A more comfortable bus option is to choose from one of the many privately-run coach services which operate between major destinations. Coach companies include Selam Bus (selambus.wordpress.com) and Sky Bus (skybusethiopia.com), among others. Be mindful that the coach journey can be long. For instance, a coach service from Addis Ababa to Gondar will take 13 hours, while flying with Ethiopian Airlines takes only an hour. Nearly all buses depart from their starting point between 0500 and 0700 Eastern Africa Time and the ticketing and boarding processes can be bewildering to the uninitiated, particularly if you don't read or speak Amharic. Anyone assisting you with your luggage, including the person passing it up to the conductor's assistant on the roof, will expect a small tip. As buses are not allowed to travel after dark, some long-distance journeys are split into two days with an overnight rest stop. You may not be allowed to remove your baggage from the roof of the bus during this overnight stop and so should pack essentials in a day bag to carry onboard. The speed limit is 30-50kph (19-31mph) within city limits and 100kph (62mph) outside. There is no official breakdown service for Ethiopia. If you are having problems with your vehicle and you are in town, the best option is to ask your hotel for garage recommendations. If you break down while on the road, you should flag down the next vehicle for help. Foreign visitors are allowed to drive in Ethiopia using an International Driving Permit for three months. After that an Ethiopian licence is required. Travelling after dark outside Addis Ababa is not recommended due to poor roadside lighting, and the hazards of livestock and people wandering onto the road. Ethiopian towns and cities are generally safe and easy to get around by taxi or bajaj, but all fares should be negotiated beforehand. Addis Ababa has a network of fixed route blue and white minibuses that can be hailed down by passengers from anywhere along the route. This is a cheap and efficient way of exploring the capital. Within the sprawling capital Addis Ababa, there is a light-rail system, the first to be built in sub-Saharan Africa. The Addis Ababa light rail has two lines: the blue line runs from Menelik II Square in the north to Kality in the south, while the green line serves 22 stops from Tor Hailoch in the east to Ayat in the west. Extensions are being planned. All signs and announcements are in Amharic and English, making it easy for foreign travellers to use. There is also a rail service between Addis Ababa and Djibouti City (in Djibouti) started in 2018.